Illustration of the Japanese Embassy to the United States (万延元年遣米使節, Manen Gannen Kenbei Shisetsu) dispatched by the Tokugawa shogunate in 1860 (Manen 1) to ratify the new Treaty of Friendship, Commerce, and Navigation. It was Japan’s first diplomatic mission to the United States. The Japanese embassy was lead by Ambassador Shinmi Masaoki (新見豊前守正興, 1822-1869), Vice-Ambassador Muragaki Norimasa (村垣淡路守範正, 1813-1880), and Observer Oguri Tadamasa (小栗豊後守忠順, 1827-1868). Original caption: “Mr. 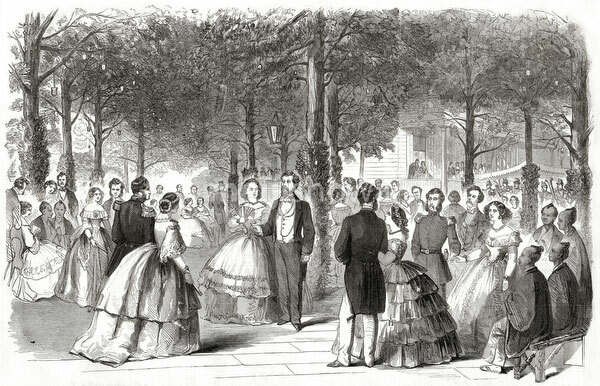 and Mrs. James Gordon Bennett’s fete champetre, at their residence, Washington Heights, in honor of the Japanese princes, June 21st, 1860-the dance under the trees.” James Gordon Bennett (1795–1872) was the publisher of the New York Herald. Some 1,000 people were invited to the banquet. Originally published in Frank Leslie’s Illustrated Newspaper on Saturday June 30, 1860 (v. 10, no. 240).